A quick disclosure: readers of my last book will be familiar with the story (which you can read here) of London-based entrepreneur Michael Acton Smith. Smith co-founded boy’s toys e-tailer Firebox.com straight out of university, before moving on to launch an interactive puzzle start-up called Mind Candy. By the end of the book, Mind Candy had gained success with its ambitious Perplexcity alternative reality game (ARG) but hadn’t quite tipped over to the mass-market. Michael is a friend – and a fellow Brit – so, obviously, I was really rooting for the company to deliver on its potential. I was one of the first to write about Mind Candy when I was at the Guardian and I promised that, when the company finally tipped, I’d be the first to write a follow up. And yet, when I left London in 2008, that tipping point seemed further off than ever. Mind Candy had launched Moshi Monsters, a virtual pet product where kids can adopt little pet monsters and buy them cool stuff by solving puzzles — but everyone knew this was the company’s last roll of the dice. Michael won’t discuss specifics but rumours around London were that his investors (which include Accel, Index and Spark Ventures) were trying to force a change of management, and were all-but taking over what was left of Mind Candy. Speaking to Michael by phone earlier today, he still wouldn’t comment on the specifics, but I did get him to admit one thing: “yeah, we were screwed”. But he can laugh about all that now. Because some time between the end of 2008 and the middle of 2009, something strange happened to Moshi Monsters. It got successful. How successful? Today, the game has 29m registered accounts across 150 different countries, with 20m of those accounts added in the last year (35% of signups are in the US while the UK accounts for 30%). 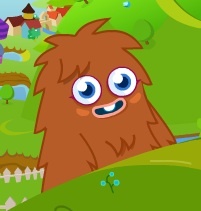 One in three children (aged 7-11) in the UK has adopted a Moshi Monster and 150 million+ puzzle games have been played. 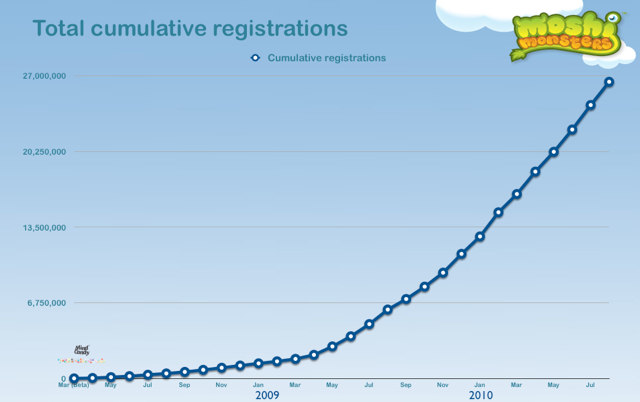 At TechCrunch we’re slightly obsessed with Angry Birds, but Moshi’s numbers eclipse it on almost every metric. What’s even more impressive is that a growing number of these users are paying to further their Moshi obsession; or, the least, their parents are. The basic game is free, but for £5 (about $7.50), players can buy a “Moshi Passport” which gives them access to additional parts of the Moshi world. The company won’t reveal exact subscription numbers but the company became cashflow positive in 2009 and has been profitable ever since. As promised then, I wanted to revisit the Mind Candy story; not least because it’s one of the few companies coming out of London that’s competing with the US in terms of profitability and traction. And yet, like Bebo before it, its profile in the US (except amongst those millions of young players) is virtually non-existent. First though, I wanted to understand how the company went from death’s door to projected sales of $100 million next year. The second is the realisation that “kids want to communicate with their friends as much as adults”. Moshi added a ‘friends tree’ and personal pinboards to allow players to connect around the game’s various puzzles, and user numbers exploded. The final secret to Moshi’s success is breaking out into real-world products. Angry Birds has its plush toys, but Moshi is going several steps further: yes, there’ll be toys (the company has signed licencing deals with Vivid Imaginations in the UK and Spin Master in the US) but the educational aspects of the Moshi puzzles has also lead to a contract with Scholastic to produce a range of puzzle books and other print spin-offs. The first of these physical goods roll off the production line in early 2011 and it’s those sales which push the company towards their magical $100 million projection. So what’s next for Smith himself? Despite the fact that he’s been building Mind Candy since 2004 and has – if the rumours are true – had a pretty bumpy relationship with his investors, he gives the standard entrepreneur’s denial when I ask about an exit. And – well – yes, with $100 million in projected sales revenue, it probably should be.